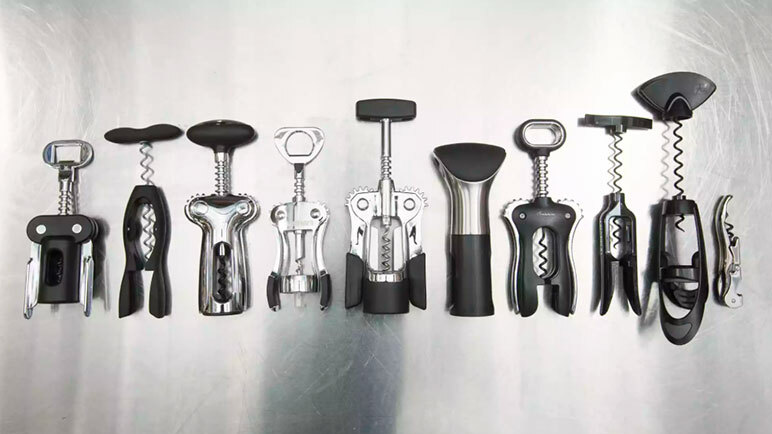 You don’t need to have a whole arsenal of wine-related tools to enjoy drinking wine. Open a bottle of your favourite wine right now and, depending on your mood and the people you share it with, it won’t matter whether you drink it from a chain store wine glass or a stem-less crystal glass. But for those who have entered into a love affair with wine tasting and constantly strive to improve their wine-tasting experience, there are a few handy tools you should have in your toolkit that are bound to make you look like a pro. Here are the 6 essential wine accessories all wine professionals simply can’t do without. The French started using cork as bottle stoppers in the 17th century – relatively late in winemaking history. Before they discovered that the easily compressible cellular composition of cork made it ideal for fitting into various bottlenecks, cloths soaked in oil were stuffed into the bottle tops. But of course, along with the creation of this ground-breaking invention, a device had to be created to remove it. And so the corkscrew came along. However, all corkscrews are not created equal. The mechanism has undergone an evolution – from the basic ‘waiter’s friend’, to various gadgets that work with levers and buttons, all the way to swanky electric ones. What is most important is that you find one you feel comfortable using. We like this basic corkscrew as we find that it maintains good leverage even when the worm is twisted all the way into the cork. Before you write off decanters as pretentious wine-drinking paraphernalia, give it a real chance. It is true that when wine is exposed to high volumes of oxygen prematurely, like for instance a leaky cork, it would be ruined. On the other hand, wine that is drunk straight after opening the bottle often doesn’t taste as good as it would if given some time to “breathe”. We know that also sounds pretentious, but exposing your wine to the right levels of oxygen at the precise right moment makes a big difference in the taste. Decanting your wine accelerates the breathing process, which unlocks the natural fruit and oak flavours / aromas in the wine. By exposing it to oxygen, some of the more volatile substances (like some of the cooped up alcohol) evaporates, making the wine taste “softer” on the palate. Decanting also helps clear the wine of sediment as these little bits of grit usually stay behind in the bottle. 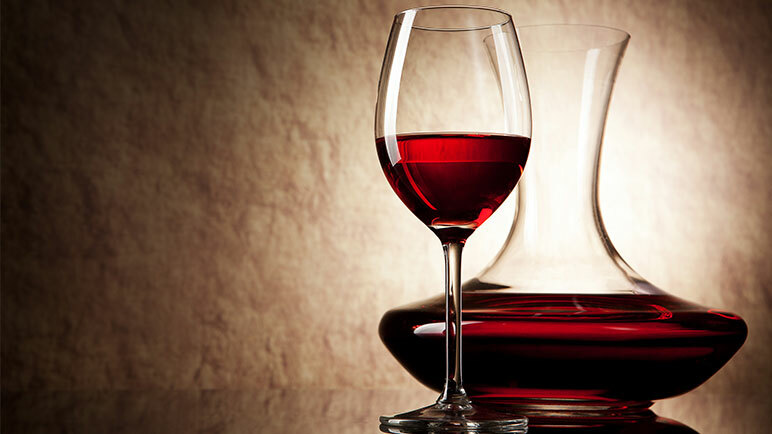 You don’t need an intricate design or a famous brand name; just pick a decanter with a wide bowl that allows greater surface contact between the wine and oxygen, and leave the wine in there for about 30-60 minutes. What if you can’t wait an hour before drinking your wine? Luckily there is a way to speed up the process described in No. 2 – using an aerator – a faster way to expose wine to oxygen that will have the same effect. Because older wines are smoother on the palate and considered more drinkable and enjoyable, this is one of the reasons older wines are more expensive. Usually, less (if any) aeration is needed for older wines. However, younger wines really come to life when poured through and aerator before drinking. 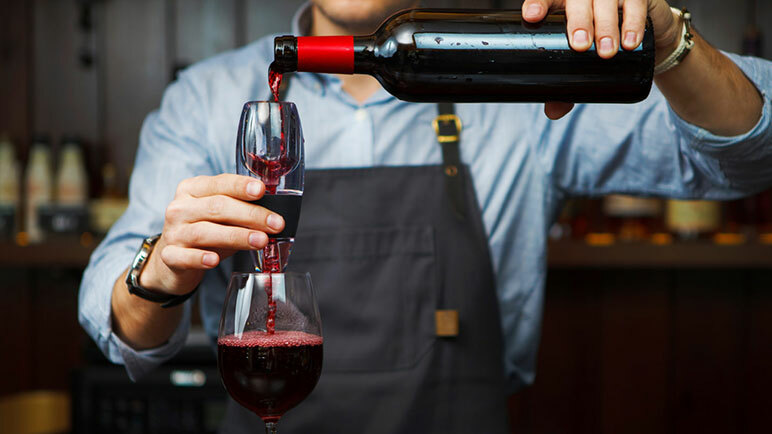 So if you’ve just bought a bottle of the latest vintage of The Affair Pinot Noir, try pouring it through an aerator to open up a whole new world of flavour. But why use an aerator instead of a decanter? The answer is quite simple. One, with an aerator the process is immediate (no waiting 30 minutes for the wine and oxygen to do its thing), and two, it’s much easier to aerate only enough wine for one glass. Why would you use a whole decanter if you’re only going to enjoy one – ok fine, two – glasses of wine? As mentioned under point No. 2, wine that is exposed to too much oxygen for too long will be spoiled. Unfortunately the process will happen whether you like it or not – which is why some believe that it’s not worth it to drink “left over” wine. But all is not lost if you don’t finish the whole bottle in one night. There are various ways to save the wine from oxidising too quickly and it will most definitely be just as good if enjoyed only one or two days later. Most people simply place the cork back into the bottleneck. However, this is not the most effective way of preserving your wine. Invest in a wine stopper that not only closes up the bottle but also extracts the air from the bottle. But if you’re not planning on keeping the wine for long, why not put a quirky spin on things and get yourself a set of wine condoms! Alternatively, look for wines that are manufactured using a screw top – the trend is moving away from cork to more reliable methods of sealing wine bottles. This one might seem superfluous. But trust is when we tell you that having sparkling, odour-free glasses without smudge marks or fluff sticking to the sides adds another layer of enjoyment to your wine drinking experience. It doesn’t need to be the most expensive microfiber cloth you can lay your hands on, but make sure you don’t use anything that scratches your glasses. They will in time become dull and hard to clean. 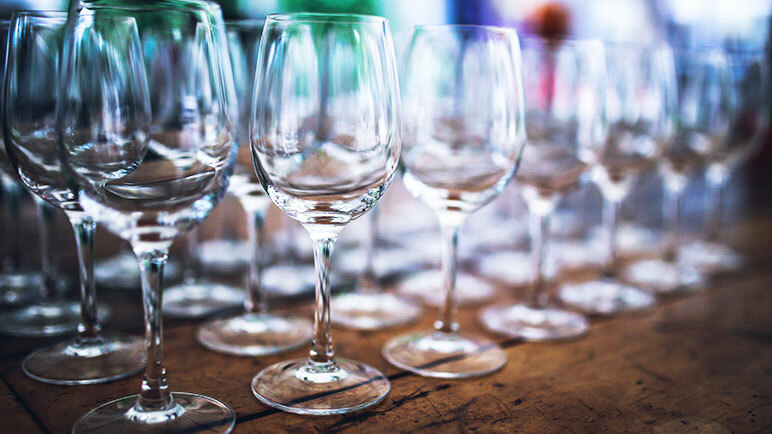 This topic is a little like a labyrinth – there are so many twists and turns to consider and it’s easy to feel a little overwhelmed when trying to find the right wineglass for your taste. What is important to consider is that not all “gimmicky” glasses will give you the best tasting experience. Look for a glass with a wider bowl and narrower rim to allow the wine to aerate in the glass but still channel the flavours directly to your nose. For a white wine, the bowl can be slightly narrower. Also, keep in mind that the thickness of the rim impacts the wine as well. Pick a thinly cut rim with no lip as this will make the wine taste smoother – a rolled rim often accentuates the acidity in the wine. And, as far as the debate between with-stem and stem-less glasses goes, it’s a matter of personal preference. But remember that the temperature of the wine will be higher in a stemless glass, because you won’t be holding the glass by the stem (the heat from your hand will be transferred to the wine). The glasses you end up buying don’t need to bankrupt you – just buy the correct shape and you’re already 80% there. But, if you’re feeling fancy and really want to up you wine tasting game… Splash out on some crystal wineglasses – you won’t ever regret it! Not everyone wants to be a wine pro, some want to leave the fancy equipment and terminology to the professional winemakers. And that’s fine too! If you just want to sit back and relax with a glass of great wine in your hand, visit the La Vierge Tasting Room where our assistants will happily tell you all you need to know in order to enjoy our award-winning wines. Stay a little longer and enjoy a meal at our restaurant or enjoy a game of boules on the patio with your friends. Visit our website for directions; we look forward to welcoming you here for a visit! Nestled in the picturesque mountains of the Hemel-en-Aarde valley lies our beautiful and bright wine estate, La Vierge. Without boasting too much, we’re proud to be the home of some of the most tantalising wines in the valley – which we aim to continuously achieve here.